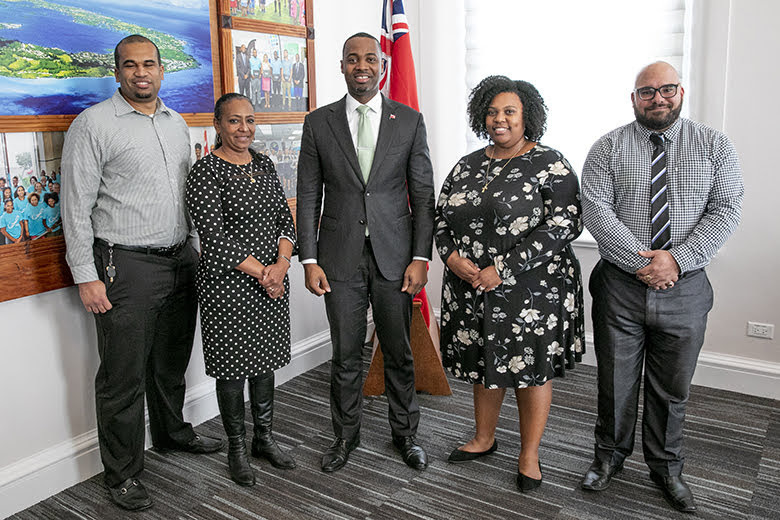 Speaking at a press conference yesterday, Premier Burt said, “In the 2018 Throne Speech we committed to creating new opportunities for our youth saying “…One area into which youth services can be expanded is representative opportunities internationally through foreign exchange programmes and partnerships with organisations like Caricom and the Commonwealth. “I am pleased to announce today that we have kept that pledge to our youth through a series of programmes designed to achieve these aims. “First, we will launch a Department of Workforce Development ‘Enhanced Programme’. The top five undergraduate summer student applicants will be nominated for this programme and assigned to the Cabinet Office to work on significant projects in the area of policy and strategy in the delivery of the Government’s initiatives. From June through the end of August they will have the opportunity to assign them to areas that match their interest or course of study within the Public Service. “Finally, we will have two ‘Leadership Scholars’ drawn from the top students of The Berkeley and CedarBridge Academy who will join the Bermuda delegation to the Heads of Government meeting of Caricom later this year. “These young people will travel with the Government team and experience first-hand the critical meetings and discussions that take place at both these annual gatherings. Additionally, we will build into the visit the opportunity to link with institutions of higher learning and student peers also engaged in the journey towards tertiary education. “By providing these opportunities we will lay the groundwork for encouraging young people to choose careers within the Public Service and will similarly provide diverse summer student opportunities for Bermudian students at the secondary and tertiary levels. “This Government promised to create the conditions that would set Bermudians on the path to success. These experiences will make the young men and women who participate, better employees, more strategic-thinking public servants and most importantly, better citizens. “These programmes are investments in the future of Bermuda. The value for money these experiences present is significant. But don’t take it from me! Today I am joined by Glenisha Simmons, Derek Lamb and Warren Simmons who are now public officers cultivated by a previous Cabinet Office Internship Programme. The Premier added, “This Government is steadily making the progress Bermudians demanded from us with their votes and through their trust. Entrenched systems are slow to respond to change but we have an imperative to deliver economic growth and increased opportunities for Bermudians. Issues at home and abroad demand our attention and as we set the stage for a more fair and equitable Bermuda, the growth we encourage will not be at the expense of Bermudian aspirations. “Our mandate is clear: Bermudians must come first in their own country and the opportunities for growth will be developed in keeping with the promises we have made and the trust we have earned and highly value. We cannot repeat the mistakes of the past where economic successes left Bermudians a distant second. “Finally we will have two ‘Leadership Scholars’ drawn from the top students of the Berkeley and Cedarbridge Academy.” What about the top scholars from the private schools who, by any educational standards – GCSE’s, AP, IB etc, often leave their counterparts in the public school system in the dust? Or would it be too galling to admit that the private school education system is vastly superior to the public education system and, incredibly,less costly?